W Hughes & Son, Single Ply Membranes. • Life expectancies as defined by third party assessments. Longer service lives are feasible and would alter the net present value outcomes. Expected service life criteria include a detailed understanding of the molecular chemistry of the plastics, additives such as plasticizers and production methods. • Life cycle costs are based on a concrete warm roof construction with simple rectangular plan. Costs include: single ply membranes 1.2 – 1.5mm thick, perimeter upstands, gutter, outlets and protrusions, insulation and vapour control layer. No allowance for walkways or access. In use costs include inspections, minor repairs and occasional cleaning. • Costs used are averages. Best value should be determined from a whole life assessment of roof covering options which satisfy project specific criteria, as much of the cost lies in the detailing and relative costs between options is marginal. 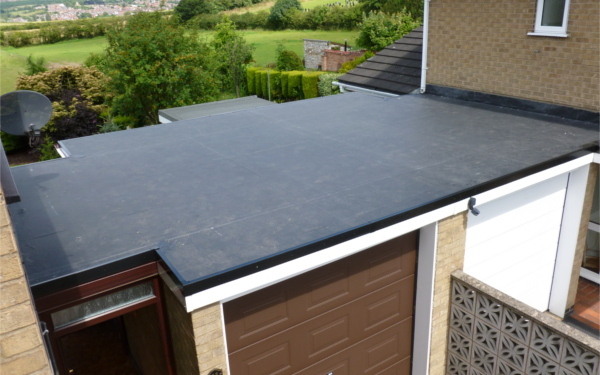 As a flat roof covering option, single ply membranes offer many whole-life performance benefits: including quick installation, the potential to prefabricate, ease of repair and good service performance. Unfortunately, there is no specific performance standard relating to single-ply membranes as EN 13956, the European standard for flexible waterproofing sheets, is currently a draft. Products with third-party certification provide a guarantee of meeting relevant test criteria and usually include an indication of the expected service life based on accelerated ageing tests and performance in use. The ability of membranes to withstand solar heating is one of the key properties for durable performance. A substantial range of single-ply membrane material options are difficult to compare directly as the testing parameters do not allow this. Below we consider some of the more common options.